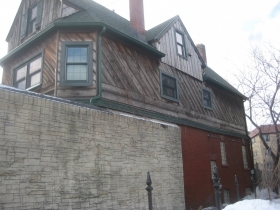 An 1888 home designed by Alfred Clas became a funny little tavern on Farwell where a bar stool always seems available. Halliday’s. Photo by Michael Horne. Milwaukee architect and seminal urban planner Alfred C. Clas was known for his grand buildings like the Pabst Mansion, The Northwestern National Insurance Building and the Milwaukee Central Library, and not primarily as a designer of saloons. 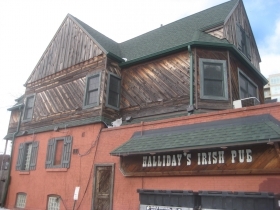 But enter Halliday’s Irish Pub, 1729 N. Farwell Ave., and you will find yourself in an 1888 mansion Clas designed for Charles Hill Ross (1838-1910), a distinguished Civil War veteran and Milwaukee agent for the Baltimore and Ohio Railroad. Ross, of Ohio, was the son of Alexander Coffman Ross, who wrote the campaign tune for America’s 9th president, calling it “Tippecanoe and Tyler, Too,”a slogan that has come down in history. Neither the architect nor original owner would likely be able to identify the structure today, inside or out, which has operated as a tavern for many decades. The only clue to the building’s age and venerable past lies in a few unobscured terra cotta window details on the building’s north and south exterior facades. The rest has been remodeled beyond recognition, yet it is still a time capsule of sorts, with a horseshoe shaped 1951-vintage bar that is old enough to collect Social Security, as are some of the customers. In 1898, in what might be a complete coincidence, Mrs. Ross was the first to withdraw a book from the new Central library built by her architect Clas. Even when first built, the Ross home was directly on the #10 Streetcar route — and that’s back when streetcars were horse-driven. The barn was located right there at Farwell and Brady St. The streetcar continued past the residence for decades to come, and will likely be bending the corner around here a few years hence. The building recedes (literally) into the background as N. Farwell Ave. became an increasingly commercial street. 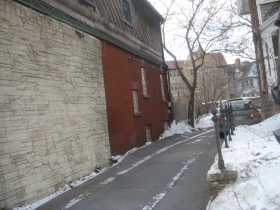 Sometime around 1928, the front of the old mansion was expanded to the east, pushing it nearly to the sidewalk on N. Farwell Ave., as a sort of first floor in a basement level. Similar conversions of residences to mixed-use, commercial / residential spaces were commonplace at that time. Examples from the era abound on N. Van Buren St., E. Brady St., and right across the street at Zafiro’s Pizza — just about anyplace that traffic and increased density along streetcar lines produced a demand for more shopping. The bar at Halliday’s. Photo by Michael Horne. In 1933 Ed Halliday operated a “Bakery and Delicatessen,” or so he said, at the location. The building was owned by Nic Quartello, and leased officially to Mrs. Julia G. Schuengel, who kept the delicatessen going. In 1936, Elmer Griggs opened it as a tavern, with Quartello the landlord. In 1951, the old glass storefront was getting dated, and Adam Rogowski, who owned the building and operated a tavern there by then, took out a $2,500 permit to change the location of the building’s entry to its current southeast corner, to raise the bottom of the windows and to apply metal lath and plaster to the exterior. He was permitted to encroach no more than an inch and a half over the sidewalk on the tight 3,000 square foot site. Once the wall was complete, Adam had Everbrite Sign Company hang a Schlitz sign outside the door. He wasn’t done with the remodeling, and applied to do more in July 1953, from about which time we can imagine that today’s bar dates. 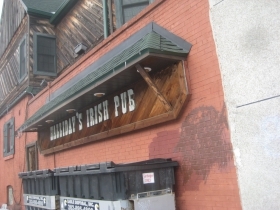 Fill in the rest of the interior with a selection of beer and whiskey signs, especially those with a shamrock theme — and let’s not forget the Irish flag snug against the bar — and you pretty much have a picture of the first level. The bar is really something special, and worth a second look. It somewhat floats in the room, and is aimed straight at the corner door, adding a bit of asymmetry to the boxy room. The bartender has two access points, with a back bar flush against a wall. The setup could handle a lot more volume than it likely receives. The south wall features a continuous bar rail with three little bump-outs, each accommodating two stools. This might set the mood for staring dreamily into a loved-one’s eyes. But, alas, my Bonnie Lies Over the Ocean. Please cue some mournful Irish tunes. On the west wall, an upper level beckons, nine stairs up, in what had been the parlor floor of the old mansion. A Jameson’s neon sign lends an Emerald City glow to this space, fully equipped with lavatory facilities and a crazy little service bar that is available for special events. The bar is “L” shaped, and has a fun rounded area at the junction. Devotees of pointed sports will also find two real dart boards here under the wooden beams, drop ceiling and ’50’s ventilation ductwork, nicely concealed. The patio. Photo by Michael Horne. A door on the south wall next to a glass block window leads to an outdoor patio, fenced against the intrusions of the neighborhood. Here, between a lawyer’s office and a FedEx copy center, a nice set of patio furniture awaits seasonal weather. 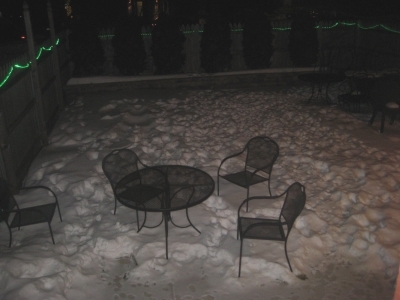 But, judging from footprints in the snow, the patio has had recent visitors, probably pacing around during a smoke break. Time to go back downstairs. Here, a ceiling fan circulates the air, while attractive amber hanging lights illuminate the worn Formica surface of the bar. The floor is carpeted, but the building is closed to the street, with only a stained glass window on the east wall, where busy N. Farwell Ave. courses with humanity. Maybe with some storefront windows, passersby might be enticed into the place. But not on this visit, when the 17 or so swivel, padded, backed stools were empty, save for a sole customer. With the server – patron ratio at 2:1, service was excellent. Tony Keller, formerly of the Brown Bottle, was behind the bar, as was Gina Marie Maniscalco. Her mother, Rosemary Maniscalco-Halliday, owns the building and the business. On the south wall is a framed tribute (including holy card) to Robert K. “Bobby” Halliday, who died in 2006 at 81. “That’s my daddy,” Gina Marie says, leaving her dice game to walk up to the picture. 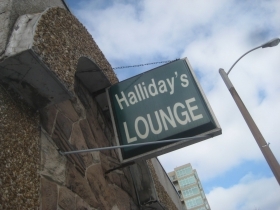 Bob Halliday’s spirit remains in the bar, even though his contemporaries are gone. He and Gus Kelepouris, related by marriage, bought the place in 1967 from widow Aniela Rogowski for $30,000. This gives the place Italian, Irish, Greek and Polish roots, which is appropriate for the melting pot neighborhood. In 1969, Halliday, who opertated the joint, put in 15 light fixtures to brighten the place, and 15 outlets for plugging stuff in to the great electric grid. 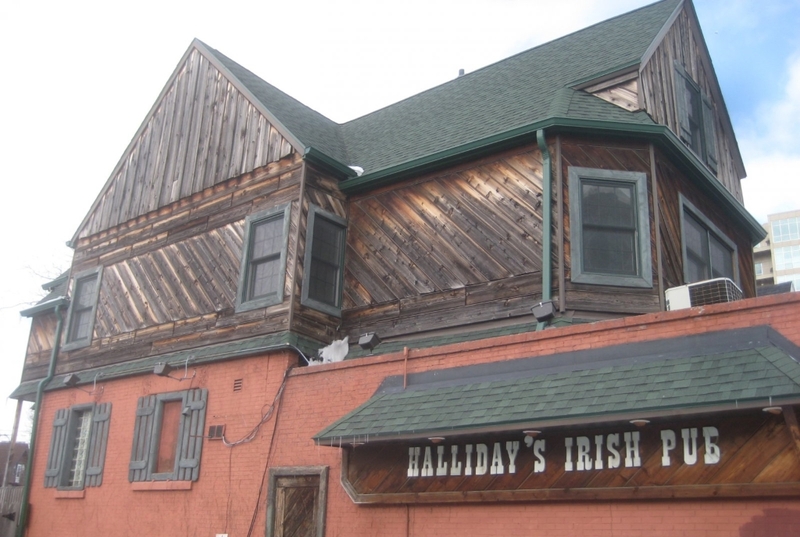 In 1985, in a misguided remodeling that totally obscured whatever architectural merit remained in the original structure, Halliday covered the thing with cedar siding laid on a bias. (A similar effect can be seen on Club Brady a couple blocks away.) This was somehow popular in the Disco era. Halliday also hung a 4 foot by 4 foot double-faced sign above the front door, as well as a banner sign on the south wall, where it can be seen by pedestrians. It could be seen from Farwell, as well, if the danged street would run in both directions, instead of just southbound. 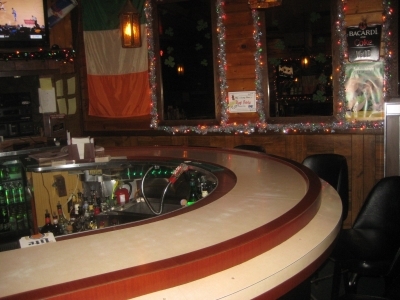 The bar is licensed for instrumental music, D.J.’s, Patrons Dancing and Karaoke. Location: 1729 N. Farwell Ave.
Subdivision: Cambridge Subdivision, Roger’s Addition. Description: Longtime owner died in 2006, but spirit lives on. Near Brady Street, but not of Brady Street. A good “while you’re in the neighborhood” option. Food: Nay, but carry-in food is permitted. A meal in the rear deck sounds like fun in summer. Get it from Zaffiro’s, across the street. Signature Drink: It’s been a Dr. McGillicudy’s sort of day. One shot per dice game, provided you don’t neglect your beer. Now, how late is Zaffiro’s open? Capacity: 80 in 1,568 square foot tavern. Year Established: Current family involved in some fashion since Prohibition. Tavern since end of Prohibition, and probably before. 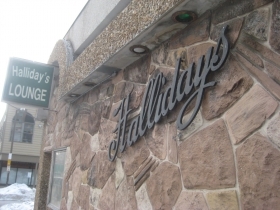 Adopted current style as “Halliday’s” in 1969. Owner-occupied for two generations. Year Building Constructed: 1888 as upper class single family residence by noted architect A. C. Clas, street level expanded to east, 1928. Current bar and street level facade dates to 1951. Interior walls and exterior upper levels date to 1985. Other work done in 1967, 1969. Estimated Annual Rent: $35,358 per year for 1,568 s.f. tavern [$22.55 / s.f. / year] according to assessor’s calculations. Property is assessed at $60,000 for 3,000 s.f. lot [$20 / s.f. ], improvements at $227,700 for a total assessed valuation of $287,700. Licensee owns building, taxes of $9,492.89 are paid in full. Walk Score: 93 out of 100, “Walker’s Paradise.” Especially if you’re headed to Halliday’s. Transit Score 55 out of 100, “Good Transit” Got busses all over the place. Future site of streetcar extension, just a block off the bike path. 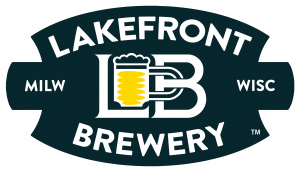 Take a break from the Milwaukee Yacht Club scene and head ashore for a couple. Games of Chance: Five of those infernal machines and bar dice! Games of Skill: 2 authentic dart boards, one electronic board. Aldermanic District: 3rd, Nik Kovac. I’ve been to Hallidays many times but never knew it was formerly a mansion! Thank you, Michael Horne, historically accurate and interesting as ever!